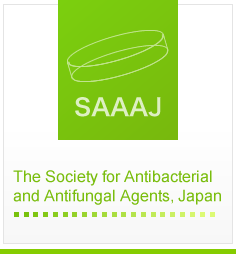 The Society for Antibacterial and Antifungal Agents, Japan is an academic organization, intended to contribute social welfare, where industrial, academic and governmental researchers and technical experts exchange information on weapons and strategies to quantitatively control the growth environment by means of physical, chemical, and biological procedures. The society publishes periodically a monthly official journal "Journal of Antibacterial and Antifungal Agents" in Japanese with abstracts in English and a quarterly "Biocontrol Science" in English. In addition to an annual meeting and a general conference, a variety of seminars, symposia, technical meetings and research conferences are held from time to time. Such activities promote an antibacterial and antifungal academic exchange ranging from basic to applied fields. Your kind cooperation is highly appreciated. The "(a)" shown in the above e-mail address indicates "at sign" or "commercial at", @. Please e-mail us using "at sign" or "commercial at", @ instead of (a).